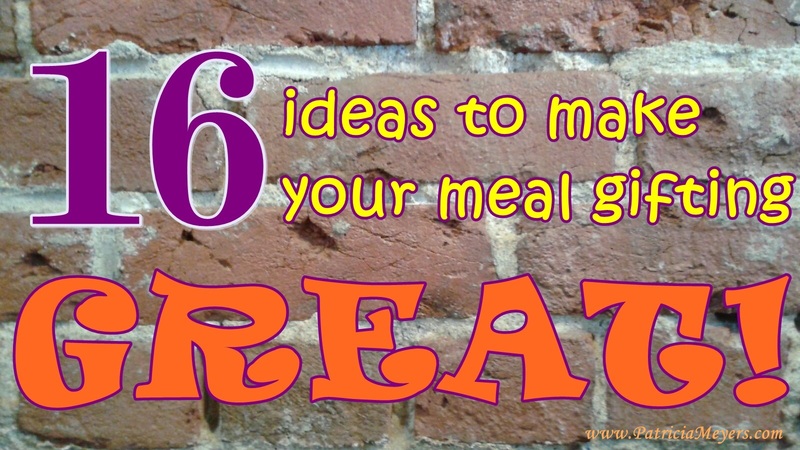 ← Be a GREAT meal gifter! Part 1b of a 3 part short, helpful series. 8. Think outside the box. I know there are a few “regular” meals everyone thinks are meals you take to those in need. But what does your family like? Make that. Don’t worry about recipes everyone else says are a good idea, make what you like. If you have a family favorite, it is probably something you cook well. That’s always fun for the recipient. And include the recipe. That would be an extra nice touch. 9. How about, instead of signing up to make a main meal, bringing muffins and cookies and chips and cereal and crackers and juice and tea? That will be a fun thing when the caregiver or bed-ridden friend wants a munch or a snack. It’s not all about the main dinner. 10. And what about breakfast? Or breakfast for dinner? That would be a welcome change of pace. Or, in addition to a simple dinner, add a breakfast casserole that only needs to be put in the oven in the morning. Boy, would you come out looking like a hero. 11. Go by mid day and throw a meal in their crock pot (make sure they have one) so it will be ready for the dinner hour. They get a hot meal and – BONUS –they get to enjoy their house smelling awesome all afternoon. 12. Do not rattle off a list of instructions. If your dish comes with instructions, write them out on a card. You do not know how stressed their brains are. You might think “this is simple, no big deal.” But for them it may be a huge deal and your words may sound like the teacher on the old Charlie Brown shows. Upon your departure, they will look at your dish and try their darndest to remember one thing you said. Write it down. 13. Please, please, please, please don’t bring dishes that have to be returned. Please. They already have enough on their agenda. Please don’t add one more thing. I am saying please. 14. If you are delivering the meal, don’t overstay. It is so easy to do and they may make you feel like they want you to because they are nice and want to be hospitable. But typically, families that need meals are going through something major. If you are dear friends and you know they need some company; that is one thing. Or if you can deliver early in the day, they might enjoy a little visit. But if you are delivering at the dinner hour, they are probably worn out from a tough day. Exit smoothly and quickly. It will be thoughtful and appreciated. 15. Include a thank you card that says something like “The pleasure of being able to do something for you at this time is all the thanks I need. Please do not spend one minute on a card for me. Spend that minute doing something for yourself. I am thanked in full.” Again, you are taking one thing off their list. Everyone is busy, so this gesture is doubly appreciated. The receiving family knows you have a full schedule and yet you took time out to help them. It touches a deep place in the recipient’s heart. So, do you have a favorite thing that you bring when you are the meal maker?Please share it. I’m going to share mine. It is Stuffed Sweet Potatoes. They are a huge hit wherever I bring them. They can be heated up individually so everyone can eat when it suits them. And they freeze fabulously. You can make this recipe as large or small as you like. I’ll give my portions using four sweet potatoes. But just make a pile of stuffing, scoop out the guts of the potatoes, mash it all together, and pile it back in. No right or wrong. Click here for the recipe. Next we are going to talk about being a meal gifter if cooking is not your thing or if you are just toooooo stinkin busy.